The folks at Princeton's International Networks Archive (INA) are hard at work creating a new system of mapping that reflects the spread of information and increase in globalization that both unites and stratifies people around the globe. To do so, they're creating an archive of globalization, spanning the past 2,000 years, to help them create their new system that won't be based on geography, but will be rooted in global transactions instead. As a part of this process, they've done some extensive homework on how transportation works around the world, and turned it in to a really fascinating document. For example, the world's longest horse-drawn journey is eight years, completed in 1998 by a British family who traveled 17,200 around the globe in a trailer. For every 1,000 people, there are 785 cars in the US, 151 in Mexico, and 25 in India. At the same time, there are 80,832 registered rickshaws in India (and an estimated 500,000 total rickshaws there) and 12,053 yellow taxis in New York City. 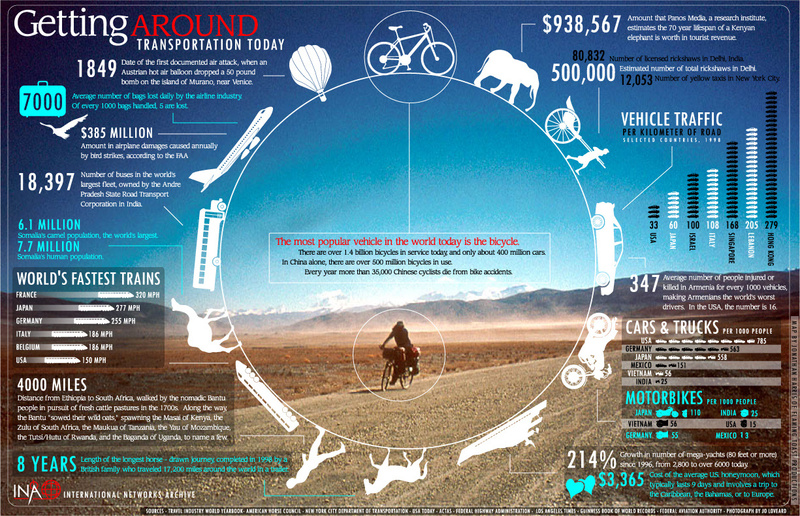 Through all the stats, numbers and facts, one stands out: the bicycle is the world's most popular vehicle. 1.4 billion bicycles can't be wrong. ::INA Infographics. See also: ::World's Most Energy Efficient Vehicle? A Bicycle. Thanks to Nick Aster for the tip.